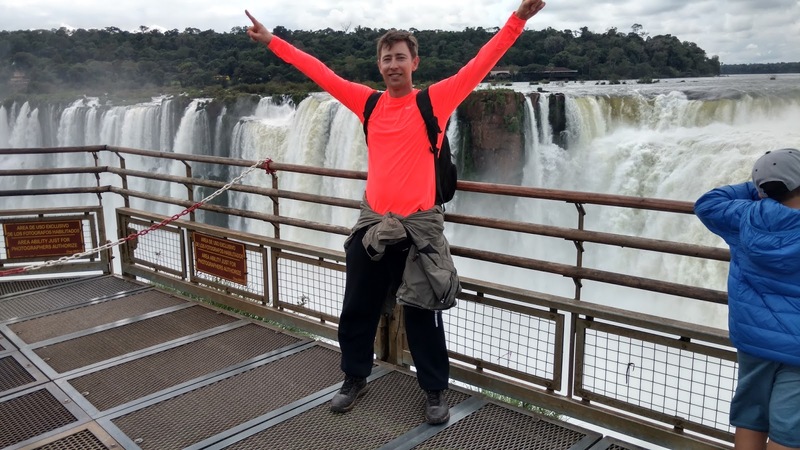 My AirbBnb in Puerto Iguazu lies 14km away from Iguazu Falls, and the airport lies in the opposite direction. Adhering to my beloved motto of efficiency- using my time and resources to the best of my ability, I pack my bags and bring them with me to the park, renting a locker in an effort to avoid retracing my steps while I gaze at Devil's Throat. Positively awed by what I've seen, I return in the afternoon and grab my bags without a care in the world, dare I say inspired. Inquiring about transport, I discover the buses only return back to town, none head to the airport. No worries, I'll take a taxi, I walk to the stand and inquire. "$30??? I thought the airport was close." "How far is the airport from here? "So, there are like 6 of you sitting around here with no work, anyone ready to negotiate, cause that is a steep price." "But how can you charge like double what I would pay for the same ride in New York City??" "Thank Macri," one of them answers me a little disgusted, referring to Argentina's current President. So now I assess the situation. I can get taken to the cleaners, or maybe ... maybe I can save the money and have a little adventure. I'll try to hitch-hike there, and if worse comes to worse, I have enough time to jog to the airport and make it. Heck, it's only 6.2 miles. I explain my decision to the taxi drivers, giving them one more chance to lower their prices. They merely chuckle, and wish me luck. I start walking down the road away from the park, a civilian car headed towards me. I animatedly wave the couple down. They stop and I explain my plan, they offer to drive the mile-plus to where the road leading to the national-park intersects with the main road. I gleefully accept. Driving uphill, I suddenly realize I hadn't included included that into my calculations, and while I'm grateful I'm getting a ride this far, wonder what I else I might not have factored in. Stopping at the main intersection, actually, the only intersection for miles, the girl asks me if I'm sure this is where I want to be dropped off. Gauging her husband's grunt to the question, I realize the reason they pulled over was her kind heart, and I don't want to push my luck. "Thank you, I'll be fine, I assure them." I grab my two bags, and exit out onto the jungle road, waving them a grateful good-bye. I stand there, alone, listening to the sound of insects humming and birds chirping. Minutes pass, and there hasn't been any movement on the road, in the bush. Nothing. Now, it's been about 6 minutes, and there hasn't been a single car. I realize I'm on an unavoidable countdown towards missing my plane, towards being stuck in the jungle for the night as darkness will fall soon, towards getting eaten alive at dusk by dangerous jungle mosquitoes (zika, malaria, dengue), towards, and this is the worst part, being totally inefficient. I briefly consider walking back and taking a taxi, but the idea of being robbed like that combined with backtracking, not to mention the smirks on all those smug faces add up to a non-starter. I'd better start moving towards the airport. I sling my two bags over my shoulder and start jogging down the jungle road. A half-mile later the humidity of the rain forest, combined with 27 pounds of luggage is seriously slowing me down. My stride falls off into a walk, but survival instinct kicks me back into gear. I hear the rumble of a car in the distance. I'm in luck, it's headed my way, and it will be the first one I've seen. I wave strongly and passionately, but they speed right on by. Oh man, am I going to make my plane? It's going to be close at this weighed down pace. Could you miss this traffic cone jumping up and down in the middle of the Iguazu Jungle? I plod on, making sure to keep a decent pace. What would be easy without the extra weight flying back into body with each stride becomes an exercise in grit. Five minutes later, sweat pouring down my body, I hear an SUV coming my way. I'm doing everything I can to stop it. As it arrives within visual striking distance, me, the orange traffic cone featured above starts leaping up and down like a basketball player catching an alley-oop. I'm yelling, "Hey! Hey! Aqui! Aqui!" I see him nod his head, as his newer model SUV slows and he comes to a stop. I feel elated, as he opens the passenger door. He's surprised by my brief story, but he seems kind, and tells me to get in, which I do instantly. He tells he can take me a couple miles, but then he's set to take another road back to Brazil. No problem I tell him, knowing the odds of making my plane have increased dramatically. He chuckles as we drive along. 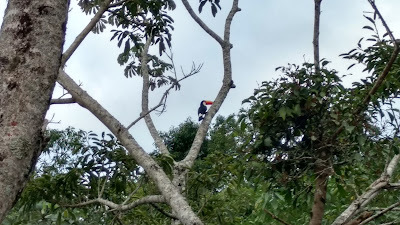 I see movement in a tree, and point to the probably the world's most beautiful bird, the South American toucan. He slows down as elated as I am to spot this gorgeous animal. "The toucan inspires me," he states, with me nodding my head in affirmation. We share the moment. "Never mind," he says, "I'll take you all the way to airport." We drive past his turn, and a few miles later he drops me off at Iguazu Airport. I thank him greatly, he smiles and nods back, and I literally skip into the terminal with an hour to spare, and go order a treat from the cafe as a reward. Mr. Taxi-Drivers, I win! Want to travel with me? Efficiency and adventure. Who could resist?